Poor or blocked drainage systems. Flash floods occur swiftly and without warning. The immediate danger is from the strength of the water current as it surges through an area, carrying debris and causing injuries and drowning. A flash flood would most likely result from a heavy rainstorm that stalls over any of the creek basins. As little as three to four hours of rain in the foothills could begin to overflow stream banks. The terms “10 year,” “50 year,” “100 year,” and “500 year” – flood, describe the probability that a flood will happen. They are based on historic rates of flow from a river or creek, and are often used to determine insurance rates in National Flood Insurance Program (NFIP) communities. Know your neighborhood flood history and low-lying areas. Consider purchasing flood insurance; most homeowner’s policies do not cover damage from rising water. Your insurance agent will have more information about the National Flood Insurance Program (NFIP). 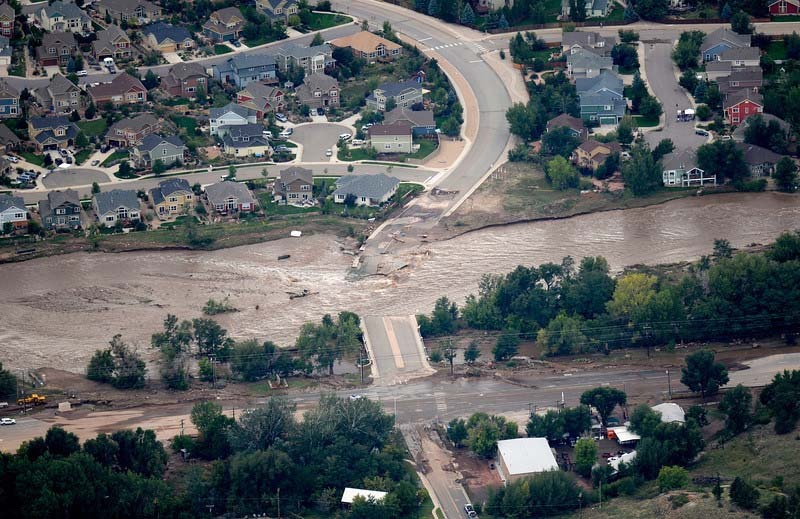 Determine if your home and workplace are in a flood plain. Stay alert for changing weather conditions. When conditions indicate the potential for flooding, get out of low-lying areas, canyons and areas downstream from dams. If flooding becomes very likely, consider filling up sinks, bathtubs and other containers with clean water. If you receive a flash flood warning, move to higher ground immediately. If you can evacuate safely and have been instructed to do so, move quickly. If you cannot evacuate safely, go to the highest floor in your house. Take your emergency supplies with you. Do not drive over a flooded area or around barricades. Abandon a stalled vehicle and immediately move to higher ground. Avoid moving water – six inches can knock you off your feet, and 18-24 inches can float a car. Follow the instructions of authorities and obey posted warnings. Wait for officials to determine if the water is safe to drink. Throw away water and food that has come into contact with floodwater. Check for utility outages. Utilities will have to be turned back on by a professional. Continue monitoring radio and television for information on weather and recovery efforts. Consider asking a professional to evaluate your home for mold. Use bleach to clean up – it is effective in killing germs, and can also be used to purify water to drink (10-20 drops of plain bleach per gallon of water).